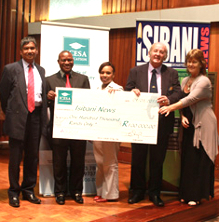 In a bid to uplift and educate the community, ICESA Education, a prominent private education provider in KwaZulu-Natal, and Isibani, a newly established community newspaper, have partnered in a R100,000 bursary programme for disadvantaged matric students. The bursary handover took place at a media event on 1 March 2013, at the SABC building in Durban. ICESA is a private education institution and is registered with the Department of Higher Education and Training (DHET) to offer both full-time and part-time courses across a broad range of disciplines, from business to fashion. ICESA recognises the importance of developing job skills that are currently in demand in the workplace, and therefore our academic programmes are designed with this in mind. This means that ICESA is the best place to help students get started on their chosen career path. We have two campuses located in Durban, i.e. City Campus and Matric School, and another campus in Pietermaritzburg. Every year, ICESA allocates a budget for the provision of bursaries to deserving students, who would have otherwise not been able to study. These students come from communities that are ranked amongst the poorest in the country. This initiative is in line with our corporate social investment strategy. “The education of our young people is very important to us and by offering these ICESA bursaries to deserving candidates, we believe that we are making a positive contribution to the education landscape,” explains Carol Spence, General Manager of ICESA Education. The bursaries will be allocated to students who excel in academia, and come from rural areas throughout KwaZulu-Natal such as Amajuba in Newscastle. Matriculants should not miss this exciting opportunity by looking out for adverts in the next issue of the Isibani newspaper on 8 March 2013, inviting them to apply for the bursaries. For more information, visit the ICESA website on www.icesa.co.za.